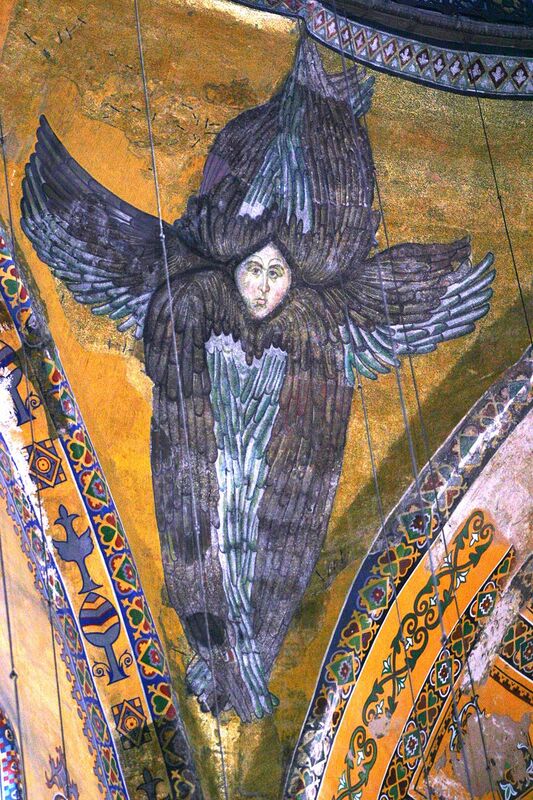 Archangel Michael, or as Romanians call him, Mihail, is by far the most popular and well known archangel in the entire monotheistic tradition. He is mentioned in the Bible, in the Quran, in the Essenian writings and apocryphal writings but also in spiritual and esoteric works. His name “Mi Ka El” comes from Hebrew and was misinterpreted as meaning “Who is like God“, inspiring a tremendous greatness and power. His name is actually a rhetoric question, not an affirmation, becoming “Who is like God?“. In other words, nobody and nothing can be compared to the greatness of the Almight God. He is one of the archangels associated to the planetary spheres. Many sources place him in the Solar Sphere while others portray him as chief in the Sphere of Mercury. 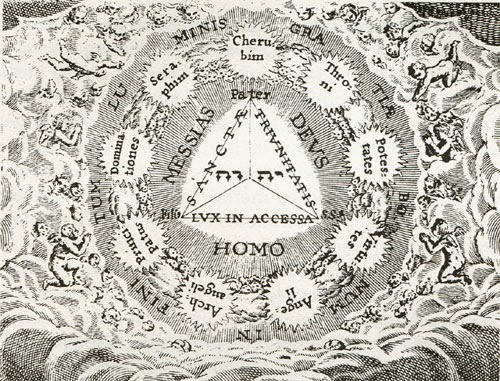 In the angelic hierarchy, the Sphere of Mercury corresponds to the angelic order of Archangels, so it is correct to say that Michael is the Chief of the Mercurial Sphere while also being the Chief of the Archangels as he is being portrayed in the majority of sacred texts. He is portrayed as a vigorous young man with shining long hair, dressed as a king leading his armies, carrying his gold armour and purple mantle. He always carries his fiery sword of justice or his spear, sometimes even the flag of the divine armies, all in a blinding golden light of which darkness and all its beings run away from. Iconographic, he is the angelic prototype of Saint George, many times being found in the image of a victorious conqueror over the dark forces and over the Dragon. 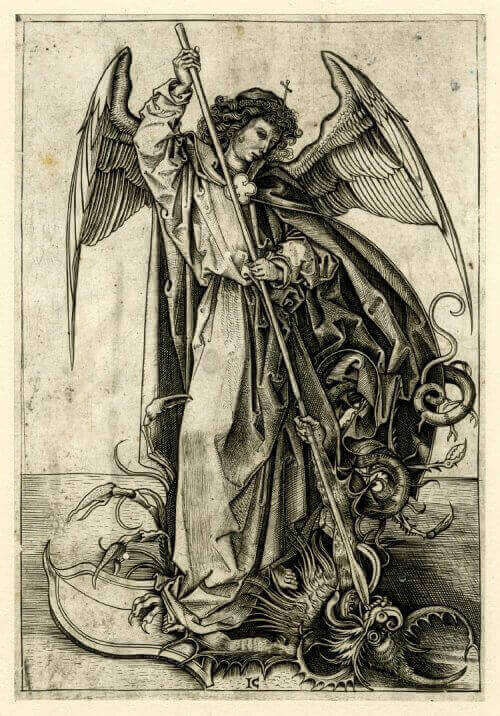 He is one of the few archangels mentioned in the Bible by their name, which is very rare for angels. The name of Michael appears in the “Book of Daniel“, “Book of Judith” and “The Revelation (Apocalypse) of John” and the number of apocryphal writings in which he is mentioned in highly numerous times. In the Jewish tradition, he is seen as a very important angel, “competing” in popularity perhaps only with Metatron. 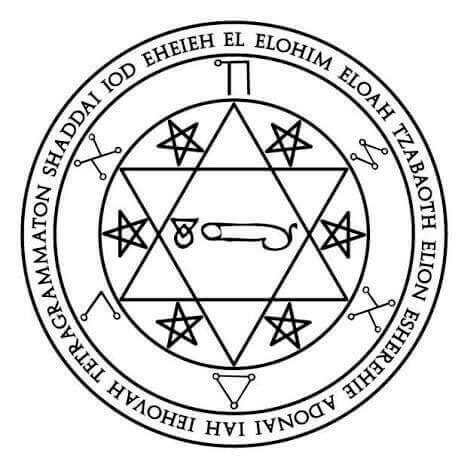 He has numerous apparitions in many non-canonic or traditional books, and sometimes his identity can be implied from the titles with which he is invested. He appears in the famous “Book of Enoch” as one of the Angels of the Presence along with Gabriel, Raphael, Uriel, Suriel, Raguel and Phanuel, having multiple apparitions and multiple missions from God. Michael is the one who hears the screams of people oppressed by fallen angels, for which he asks justice from God and is sent to bind Semyaza, the leader of the fallen angels. The leader of the angelic armies is always merciful, loving and compassionate with the sons of men, but he is unmerciful with the rebels who fell from the Heavens. He is called “The Commander of God” and “The Prince of Israel” because of all angels, Michael was the defender of the Israelites. According to legend, he taught Enoch the mysteries of justice and clemency, Michael being the archangel of mercy, patience, forgiveness and moderation. 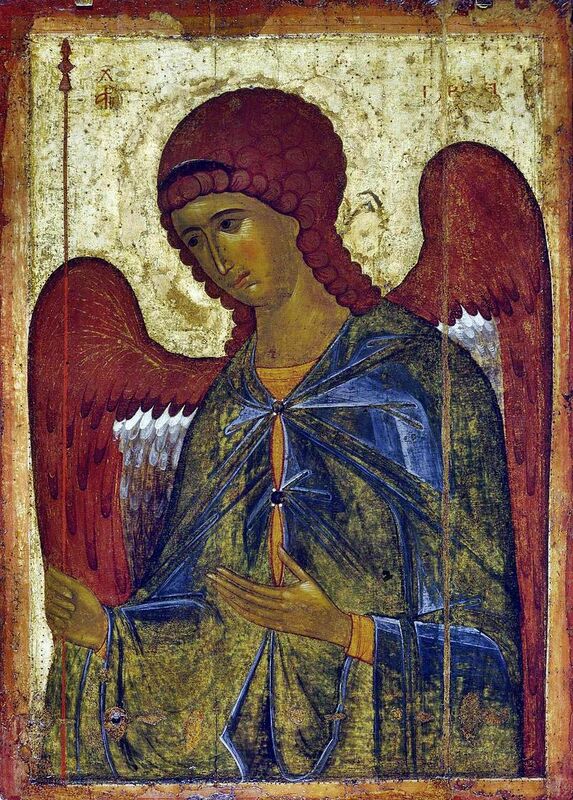 There are many other legendary traditions connected to this archangel. According to some, Michael was the first angel who kneeled before man when he was created, and remained the guardian of Adam until the end of his days. He is the angel who executed the divine order for the expulsion of Adam and Eve from the Terrestrial Paradise, though he continued to guard them and their children with much love and patience. The first archangel is also the first teacher, helping Adam to accommodate to the cruel conditions of mortal life, teaching him how to survive and showing him the secrets of working the earth (agriculture, see chap. 18-22 from pseudepigraphical writing Life of Adam and Eve). After the death of the first parent, Michael takes Adam’s soul to Heaven in a Chariot of Fire and pleads in his favor, asking God to spare him of his sin and allow his entrance in Paradise. In the rabbinical traditions we can see Michael both as a warrior and a advocate of Israel. As I already mentioned at the archangel Samael, the angels of the nations were arguing and fighting in the Heavens just like people do on Earth. We usually see Michael fighting Samael, the angel of the Romans, Dobiel the angel of the Persians or Uzza, the angel of the Egyptians. There are writings that put him face to face with evil itself, without being associated with any earthly nation, such as the Essene scriptures from the Dead Sea (the Dead Sea Scrolls). Here, all the righteous and believers, called Sons of Light, are helped in the final battle against evil by the angelic armies led by Michael. The adversarial forces, the Sons of Darkness, are led by Belial, the demon of lies, avarice, obscenity and egoism. In the Zohar, Michael is one of the four Archangels of the Universe along Gabriel, Raphael and Uriel. According to the text, Michael is the one who meets the souls of the righteous and faithful after death and leads them to the gates of the Heavenly Jerusalem, just like Hermes-Mercury did at the Greeks and Romans. Furthermore, Michael and his armies guard the entrance in Paradise, questioning those who come and granting access for the righteous and opening the gates for them. The protection of the four archangels lead by Michael is greatly efficient, and the forces of darkness cannot harm a man with a fair heart who asks for the help of God by such ways. Michael was always the friend and defender of humans. From the mythical garden of Eden to our days, his help against the forces of darkness has been one of the greatest advantages of the human race. The times when Michael comes before pious men along history are plenty. Especially those instructed to build temples, churches or monasteries are thus adviced by Michael, either in their dreams or mystical ecstasy, this being a reason for which many monasteries, cathedrals or churches are dedicated to him. In modern belief, Michael is more than just a simple archangel. The Church of Latter Day Saints (Mormons) follows the belief that Michael had a mission on Earth and was embodied as the first father of mankind, namely Adam, and Adventists and Jehovah’s Witnesses believe that Jesus was the perfect embodiment of this archangel. Not far are the ideas offered in the “Urantia Book” in which Michael, one of the seven Creator Sons of God, is named Nebadon. Michael of Nebadon’s last mission out of a total seven was the embodiment/birth in physical body under the form of that whom is known as Jesus of Nazareth. True or not, “The Urantia Book” is one of the most amazing revealed documents, offering over 2000 pages of unique information connected to the structure of the universes and Michael’s mission. Leaving aside the disputes regarding his relation with Jesus, Michael is one of the most important figures in the spiritual domain. His influence is so great and overwhelming that rarely can he be seen or contemplated by a normal individual. He usually appears in the form of a vigorous young man with androgynous aspects whose body cannot be defined due to the light in which he appears. The luminosity of his face has determined visionary artists to represent him with an immaculate white face, young, with no beard, with blonde eyebrows and hair, though his beauty and his aspect can be hardly compared to a human typology. His mild yet powerful eyes can bring consolation to the suffering but also terror to the forces of Darkness. Many icons present Michael without a face, and this is due to multiple reasons. It is said that his face is so luminous and terrible in his pure form, that nobody can look at it without putting himself in danger. He appears as a warrior king when he fights, but in times of peace he takes the form of a real sacerdotal angel: he is the Great Priest of the Almighty and every religious or magical ritual has been inspired to men by the divine office which Michael practices. 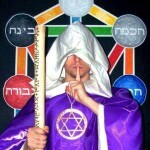 Also, he is a guide to the souls of the dead and many times he appears along Gabriel and Azrael. Traditions says that only those who passed to the other side or those whose end is near can see his face, thus his face is left unpainted in some icons. Michael’s role is that of Guardian of Humanity, of father and protector, of professor and guide, and the high spirits that are under his order are sent with the same purpose to the people who need help. His real being is far beyond our understanding, and at his will he can send an aspect or several aspects of himself in order to help, without losing his unity. He can simultaneously work on different planes and can simultaneously work on different coordinates. As he is not affected by time or space, his superior aspects can watch and govern human activity, while his inferior aspects can interact with humans directly. These inferior aspects of the spiritual personality named Michael operate in full freedom through a divine mandate in order to offer help where and when it is needed, but the fact that they are not the full embodiment of the archangel Michael does not mean they are less powerfull. Mankind cannot grasp even a quarter of such a manifestation of Michael’s subdivision, which means that his entire manifested glory would perplex and shake the entire being of any man. Angels, no matter what their rank might be, have not been created to amaze humans, but to help them, thus they choose to manifest only smaller or limited parts of their aspects, in order to be easier for man to understand them. As such, a civilization will know Michael in a way, another civilization will know Michael in another way and so on. A clairvoyant can say he has seen Michael appearing as a king dressed in golden and purple clothing, while another clairvoyant might say he saw him as a simple young man dressed in white, holding a cup and a sword. Examples are numerous, because Michael can choose to show different aspects of himself according to the power of understanding or spiritual level of the one to which he is to appear.